The 2015 membership form for the British Sake Association is now online. Membership fees remain the same. The first event of the year was a successful Sake and Ramen Dinner, held at the end of January, at the recently-opened United Ramen in Islington. The weather didn’t disappoint: it was a distinctly chilly and wintery night – perfect for bowls of warming ramen noodles. Once again BSA members and their guests were able to enjoy some innovative sake and food pairings and learn more about different sakes and how they taste, all in the enjoyable company of fellow sake enthusiasts – and, as usual, priced competitively. The sakes were introduced and presented by Asami Tasaka from World Sake who did a sterling job whilst struggling with a lost voice and recovering from a sore throat. Her most important work though had already been done beforehand – choosing the sakes and pairing them with the food. And this she did magnificently. Aaron Resch from United Ramen laid on a generous feast, and willingly catered for the vegetarians amongst us. We started with spiced edamame, which was paired with Dewazakura’s Oka Ginjo, sometimes seen as the signature sake of World Sake, which was served chilled. 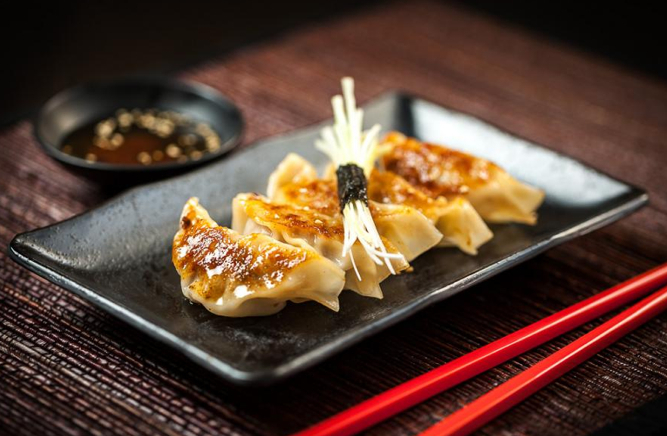 Next came delicious light and tasty handmade pork gyoza: these were described by Giles Coren as gyoza to ‘make your day’, and indeed they were, especially when paired with Kamoizumi Shusen- a junmai sake served at room temperature. The generous and uber-tasty Asian BBQ pork ribs (modestly described as a ‘side dish’) were then served alongside Sentoku Bessen, a remarkable futsushu from Gunma prefecture. The main course – a huge bowl of ramen – was paired with the Shusen again. But this time served warm, which seemed to really bring out the woodsy, mushroomy aromas of this junmai from Hiroshima. It’s always fascinating to taste the same sake at different temperatures (and of course alongside different foods too). Something you can try at home. Finally we were treated to a sumptuous dessert of two mochi ice creams, with fillings of yuzu, and mango. Delicious on their own, the flavours were only enhanced by the Kamoizumu komekome ‘Happy Bride’; – a low alcohol and mildy sweet sake, rich in amino acids and described as Riesling-like, again from Hiroshima.